I make most of my personal sizing dies these days, so I haven't been up to speed on the quality of store bought sizing dies. A customer was nice enough to loan me some of his sizing dies for inspection. Buffalo Arms 0.359" die. 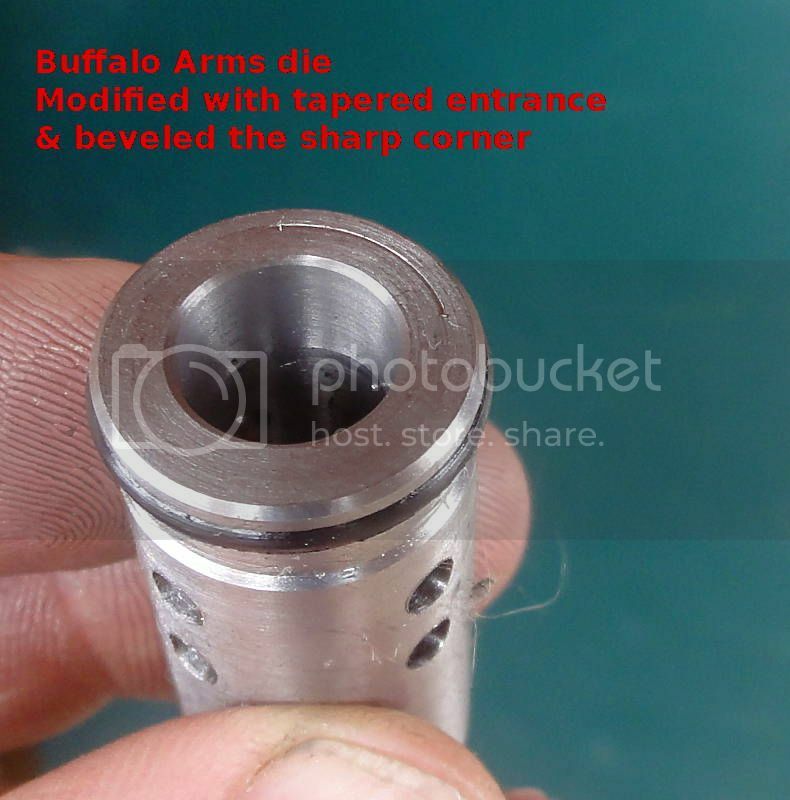 It appears that Buffalo Arms took a Lyman die to a machine shop and said "clone this." And for the most part they did. At first glance it appears to be identical to a late model Lyman die. But wait, notice how the stem is a perfect fit in the entrance of the die? That means there is no taper at the entrance. None, zero, zilch, as verified with calipers. Plus there is a sharp corner at the entrance. This die is guaranteed to mangle bullets. Do not use it as-is ! -- the die is not hardened. -- the top of the inner stem is slightly concave, which is a good thing. -- like its Lyman parent, the top lube holes seem to high to me. I often have to plug the top holes. Your mileage may vary. Lyman 0.359" die. Appears to be of recent vintage judging by the packaging. This is the die that was sizing bullets off-center as posted on another thread. 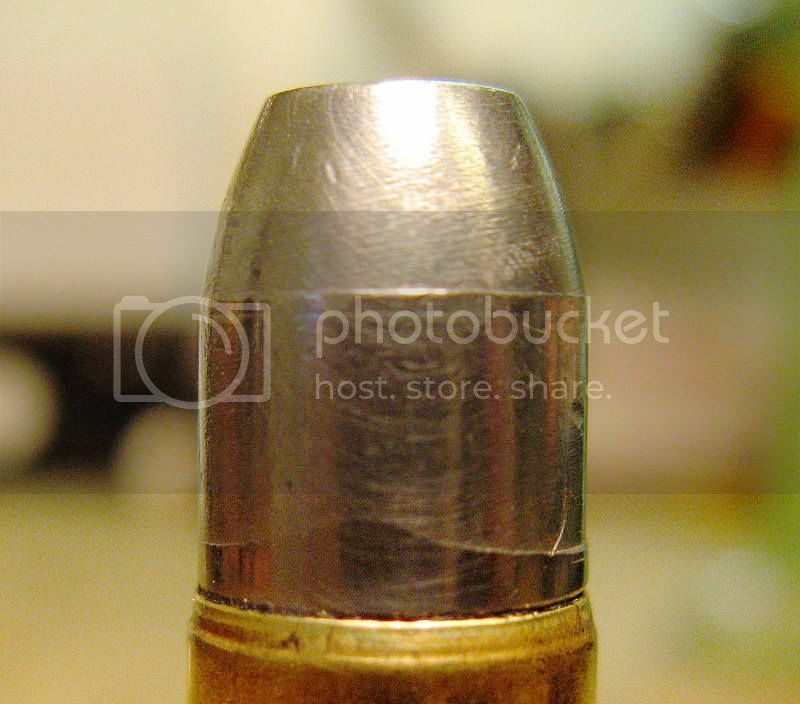 It's possible that the mangled bullet could be due to the nose punch being off center relative to the die, though in my experience a good die simply won't mangle bullets no matter what. -- the die is hardened. -- the ID was actually 0.3594". -- the lube holes seem too high to me. I often have to plug the top holes. -- the inner stem was 0.3572" diameter, a loose fit. In my experience, you get significant lube leakage out the bottom of the die when the fit is that loose. -- there is a slight taper at the entrance. The taper starts at 0.377" ID. However, the taper is only about 0.100" long. So it is better than no taper, but still inadequate. -- there is a fairly sharp corner at the entrance. The sharp corner can mangle bullets. It's a common problem on mass-produced dies. -- the lip of this die had cracked and broken. I'm guessing the die is brittle because it was not tempered adequately after hardening. Also it is simply a bad design because the top lip is too puny. Compare the puny top lip on the Lyman die to the beefy top lip on this older RCBS die. Maybe there is a reason for the puny top lip, but I have several dies with a beefy lip and they work fine in my RCBS lubrisizer. Next up, a 0.358" Lee push-thru. -- the bevel is followed by a gentle taper. The taper starts at 0.370". -- the inner stem is only 0.353". This can result in a "feather edge" around the base of a plain base bullet. I would prefer a slightly snugger fit. -- the sizing portion is only about an inch long. The remaining part of the die is oversize. -- the inner stem pushes the bullet through the sizing portion, then subsequent bullets will push the bullet the rest of the way. I would not change a thing about the tapered entrance -- it's just right. Since the Buffalo Arms die was not hardened, I was able to machine a tapered entrance like it should have had to begin with. Also note that the corner at the entrance has been beveled. This is what all lubrisizer dies should look like.